Can you imagine sending your child out to play baseball for the first time with the same-sized bat and ball used in the major leagues? Of course not. The USTA 10 and Under Youth Progression program was developed with the child in mind. It uses smaller racquets, slower balls, and limited court sizes, which allow children to get acclimated to the sport in a fun environment and enjoy success faster. Children are able to master proper stroke techniques at an earlier age, creating a foundation for more advanced play as they grow. Our tennis pro can place your children in the clinic level best suited for them, regardless of their age. Ready to get your child on the court today? Contact Kevin Cretella for details. 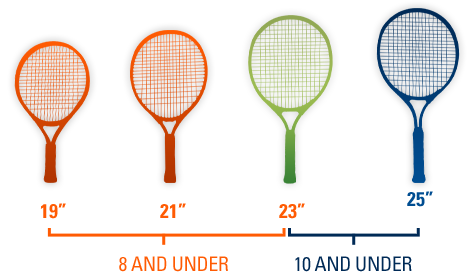 For 8 and under, the racquet should be 19, 21, or 23 inches. For 10 and under, the racquet should be 23 or 25 inches. For 8 and under, red foam ball. For 10 and under, orange ball. For 12 and under, green and orange balls. For 8 and under, best of three games with the first to seven points winning the game. For 10 and under, best of three sets with the first to win four games winning the set. For the third set, the first player to win a seven-point tiebreak wins the match.